A very happy Monday and happy November to you! With Halloween on Friday, the Starbucks red cups arrival on Saturday, and the New York Marathon on Sunday, it was quite a weekend. I honestly don’t know how people work full time and manage to throw parties and still have a packed social calendar because it can really be exhausting! I would have been just fine lounging around with a good movie on Friday but wait, that’s what I tend to do all week 😉 So, every once in awhile I try to live a little and act my age. Last minute costumes rarely come together for me, although our attempt to recreate Mary Poppins with a couple of penguins was quite the success if I do say so. Just a little Halloween spread before heading out to the streets of the east village. 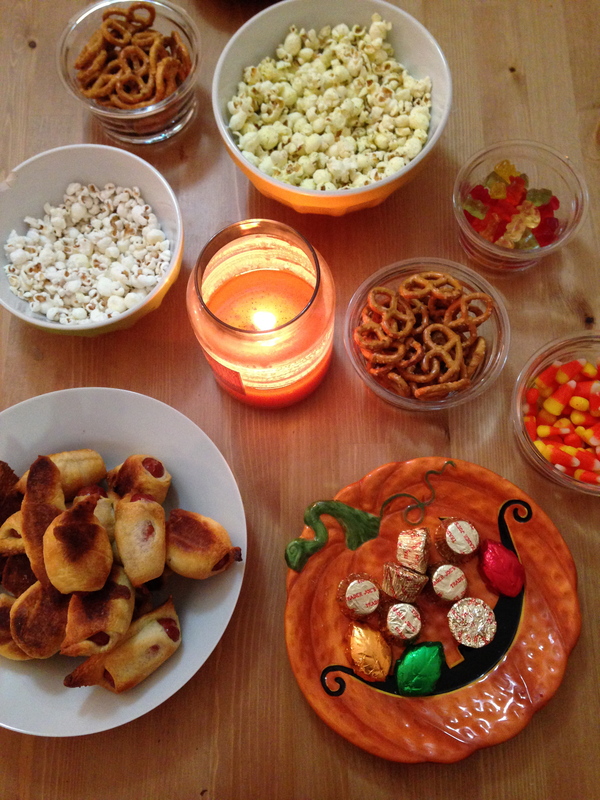 Doesn’t it look like a Snoopy Thanksgiving spread with the pretzels and popcorn adorning our small little table? One of the laziest days on record and it was amazing. After waking up for pilates and body pump, I walked home in the rain and met Lindsay for the first Starbucks Christmas cup of the season. Well, the first location we went to actually was running low, so Lindsay made another trip down the street to satisfy her craving. 🙂 The weather was perfectly gloomy, which meant we had no qualms about staying in and watching Captain America, football, and the latest Hunger Games movie. Lindsay and I were up and out the door by 6am to make our way to the water stop. 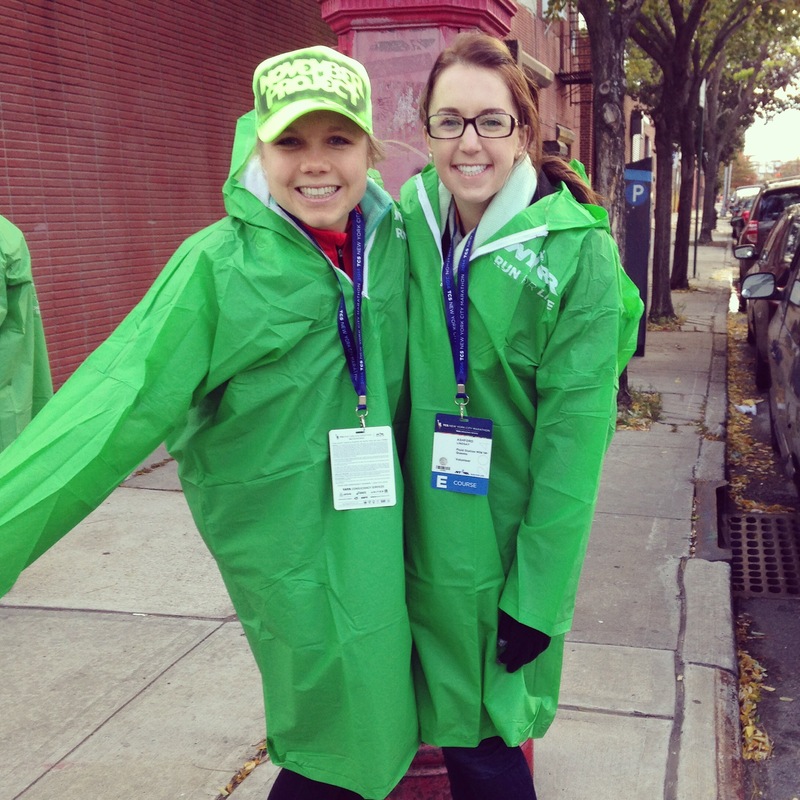 We had volunteered with the November Project group at Mile 14 out in Queens. Since this was my second year in the city, it the second time I was able to watch the marathon. As a matter of fact, it was the second marathon ever that I had watched. Usually I find it difficult to do anything but run in a race. Simply watching makes me wish I were running (even with current injuries) and volunteering seems fun but not as much of an accomplishment. Then I realized that a race is not complete without these spectators and volunteers and if I value their involvement when I am running, why not give back? 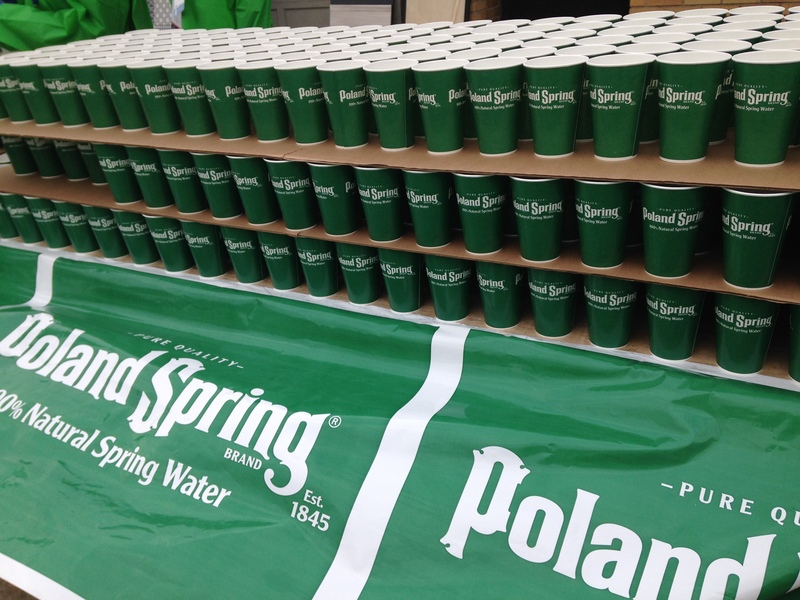 Poland Springs Oompa Loompas ready for water duty! There were supposed to be over 50,000 runners, which meant lining up almost 100,000 cups of water. The elite runners would be handed water and fuel by their coaches or their own helpers, so we could just cheer them on as they passed by. 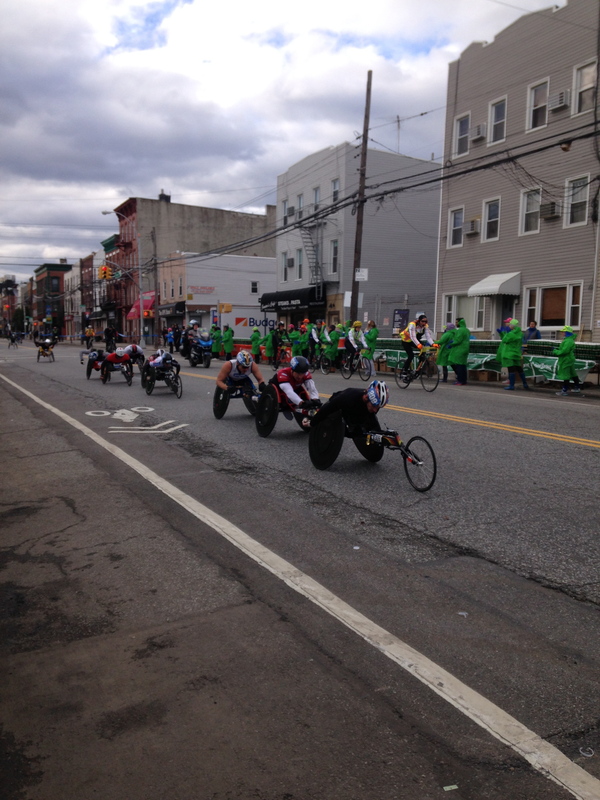 The first wave of the race was the wheelchair crew, although due to the strong winds, they started around mile 3. We had a November Project member in one of these packs and we were all so impressed by their muscle and speed. 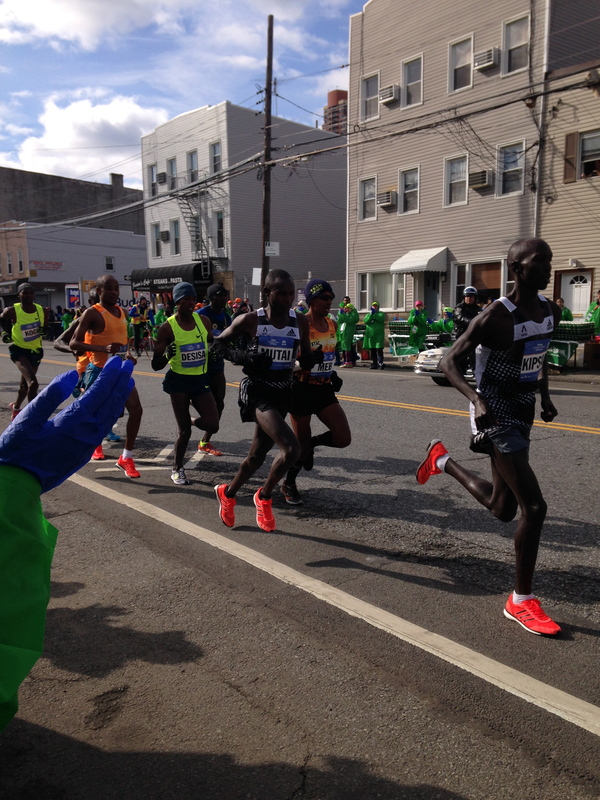 We saw the elite group around 10 or so and the rest of the runners pacing in around 11am. Then, from about 11am until 2:30 there was a constant flow of traffic, which meant we were standing from 7am-3pm, handing cups out and screaming encouragements. I did not think I had that type of energy and was left completely exhausted at the end of our shift. 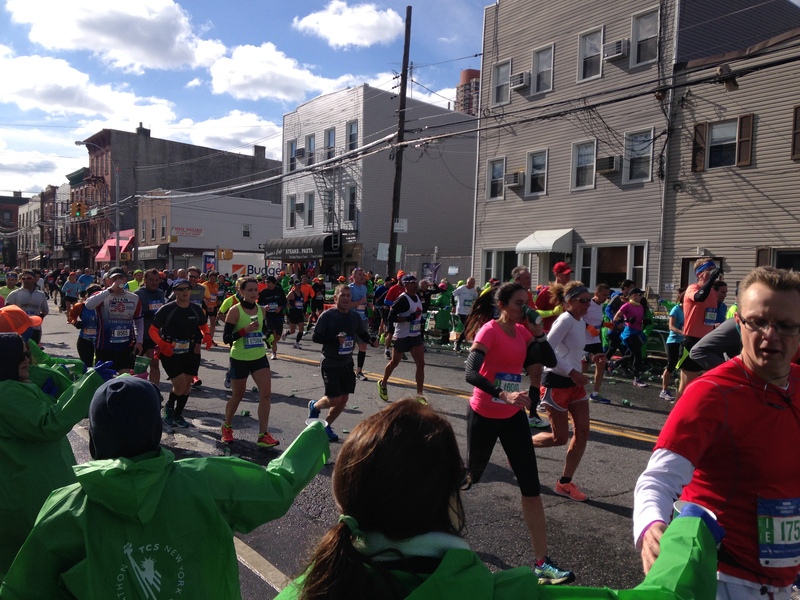 There’s something about watching one of the most famous marathons that makes me inspired to run one. Sure, call me crazy but I’m in love with this athletic lifestyle. Because of our position in the race, we saw people when they were just over halfway finished. There were some tough moments, some tight legs, but the smiles on some and determined look on others, really gave me the running bug. Now I just have to get this lovely foot healed and I can get the ball rolling. Have you ever run a marathon? How was your weekend? 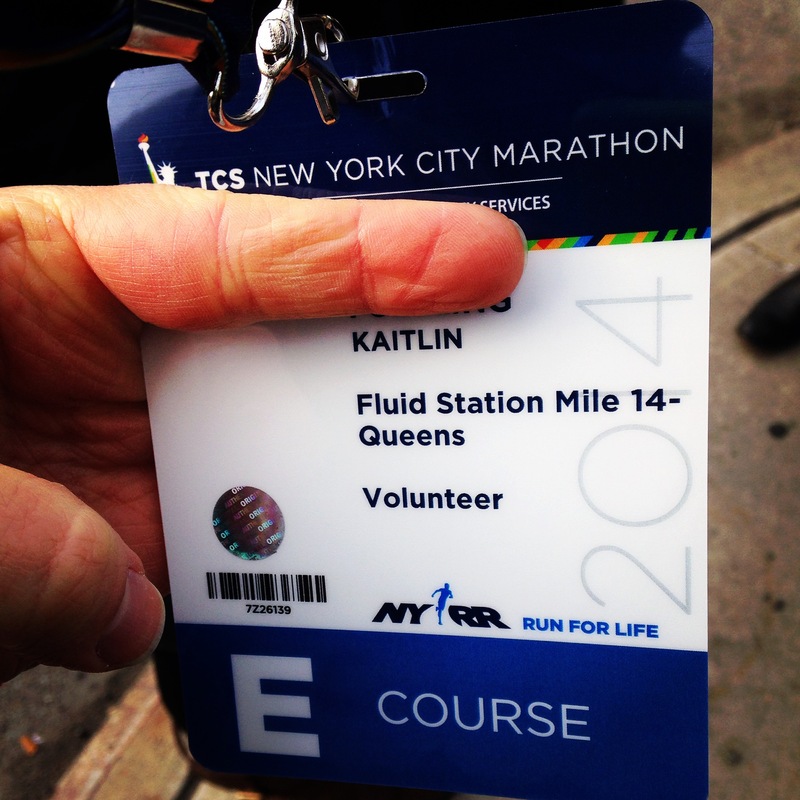 This entry was posted in Fall, Marvelous, New York, Running and More and tagged fall, halloween, manhattan, marathon, New York, NYM, Queens, running, weekend by Kaitlin. Bookmark the permalink. That’s so great that you volunteered at New York! As someone who has run a couple marathons, I’ve got to say that you have NO idea how much you’re appreciated! Having someone tell you you’re doing a good job and hand you a cup of water when you feel like death is one of the best feelings in the world. Plus, having worked at races before, I think working or volunteering at races is WAY tougher than running the event itself. Good for you! 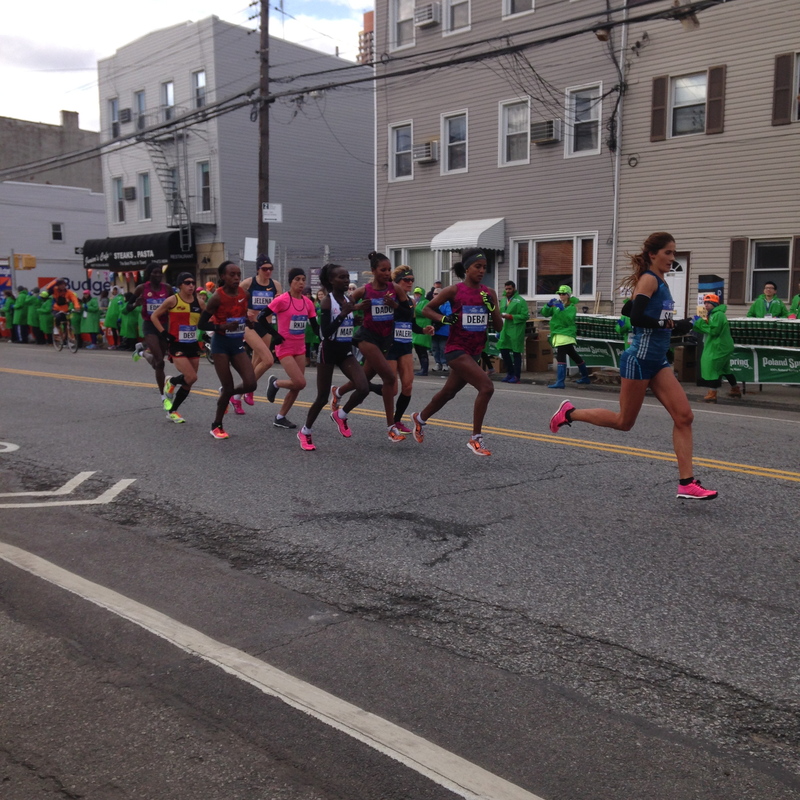 I hope to be there for the NYC marathon someday – either as a spectator or runner – and the Boston marathon, too. Others that I’ve watched in the past make me so emotional, it’s such an accomplishment! Running a marathon is something I hope to do eventually! And I looove your costumes, they are so cute!